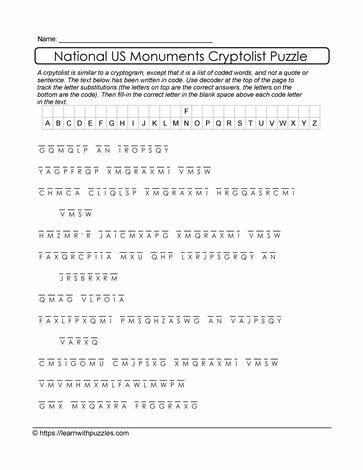 National monuments cryptolist to decrypt using an alphabet code. Start with hint provided in the decoder at the top of the page. Substitute one letter for another using knowledge of national monuments, word structures, common and uncommon letter patterns. Make learning fun and challenge family, friends and classmates. Tutoring resources, home schooling, classrooms.